If you are a college student or adult who enjoys working with people, exploring the city, and learning about local history and architecture, then we welcome you as a volunteer. The more involved you become, the more rewarding your experience will be. 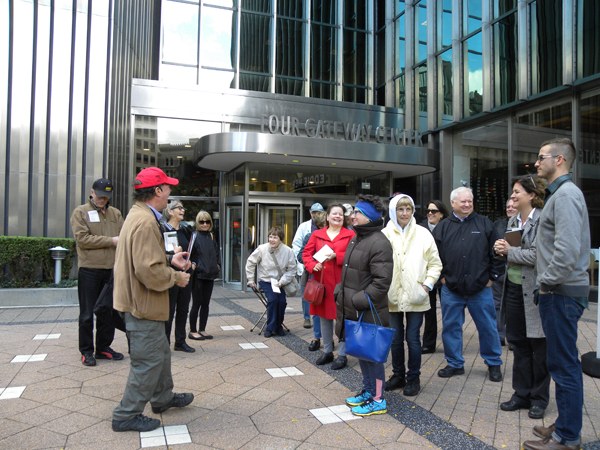 Our staff trains volunteers to lead tours for school students (grades 2-college) and adults, and to present slide shows and PowerPoint presentations to various community and senior-citizen groups throughout the Pittsburgh region. Tours and presentations are most often conducted Mondays through Fridays during school hours; therefore tour guides (docents) must be available to volunteer during the week. However, weekend tours and presentations are offered occasionally, so if you are only available then, you still can be involved. Gabe Funaro is one of 25 volunteer tour guides specially trained by the Pittsburgh History & Landmarks Foundation staff. Thanks to the knowledge, energy, and commitment of its volunteer tour guides, PHLF is able to involve more than 10,000 people each year in its educational programs. College students and all ages of adults volunteer as tour guides. Docents must become thoroughly familiar with tour/presentation scripts and teaching techniques before leading a tour or presenting a program. They are required to attend monthly meetings and shadow various tours/presentations. Docents are encouraged to read Pittsburgh’s Landmark Architecture by Walter C. Kidney, and other PHLF publications. There is no charge to prospective docents for training; however, each docent is required to pay about $100 (half the cost of the microphone that he/she will use on tours). PHLF pays the other half and each docent keeps and maintains his/her own microphone. Each docent volunteers to lead tours or to present programs according to his/her own schedule. Some docents lead tours every so often—other docents lead tours every week. Even the IRS rewards volunteers! All who do volunteer for PHLF can deduct 14 cents per mile (as of 2011; check the IRS for periodic updates) for any driving that they do to our office or to any site in which they are performing a service. Keep a record of dates, reasons for trips, and miles driven, and take your qualified deduction on your Federal tax return. Contact Mary Lu Denny either by e-mail at: marylu@phlf.org or by phone at 412-471-5808, ext. 527 to register for training.